Supreme Court nominee Brett Kavanaugh testifies before the Senate Judiciary Committee during his confirmation hearing Sept. 6. "Her recollection of these events is crystal clear," Ford's attorney, Lisa Banks, told Morning Edition. "She will agree to participate in any proceedings that she's asked to participate in." Kavanaugh was scheduled to speak by phone with Republican staff on the Senate Judiciary Committee late Monday. 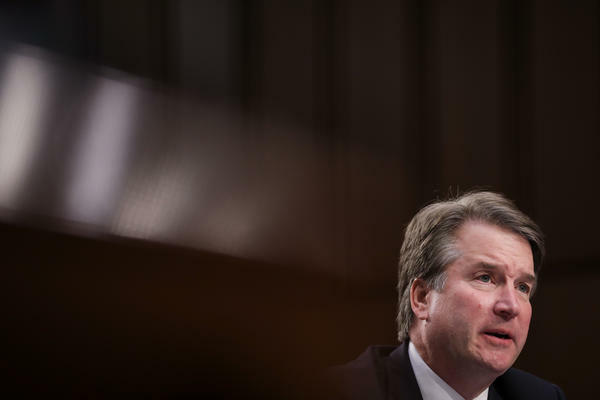 Democrats on the panel refused to take part, arguing that the FBI should investigate the allegations stemming from an incident Ford says happened at a party in the early 1980s when they were both students in high school. Kavanaugh, who was at the White House on Monday, continues to vehemently deny Ford's account. Trump expressed regret that the allegation against Kavanaugh had surfaced so late in the process but said he wants the Senate to satisfy any lingering questions. Senate Judiciary Committee Chairman Chuck Grassley, R-Iowa, said Monday that Ford "deserves to be heard," but he complained that Democrats failed to share information about the allegations when Ford sent a letter to the committee's top Democrat, Sen. Dianne Feinstein of California, in July. It's unclear whether phone interviews would be sufficient to address questions from some of Grassley's GOP colleagues. Sen. Susan Collins, R-Maine, tweeted Monday that Kavanaugh and Ford "should both testify under oath before the Judiciary Committee." As one of only a handful of GOP women in the Senate and a key undecided vote on Kavanaugh's nomination, Collins' views may carry outsize weight with Grassley. Republicans, who hold a narrow majority on the committee and in the Senate, are eager to confirm Kavanaugh in time for him to join the high court when it begins its fall term in two weeks. But faced with a growing #MeToo movement, they are also sensitive about appearances. "Unfortunately, committee Republicans have only known this person's identity from news reports for less than 24 hours and known about her allegations for less than a week," Grassley said. "Sen. Feinstein, on the other hand, has had this information for many weeks and deprived her colleagues of the information necessary to do their jobs."